It's that time of year when meetings and conferences are being planned and the savvy organiser is on the look out for some great conference energiser activities. Fortunately we've got such a wide selection that we can be pretty certain that we've got something that will not only suit your group but blow them away and we haven't...our creative team will devise something especially for you. There are a lot of a factors that will determine which conference energiser is best suited for you; the amount of time you have, the space you have in your meeting room, the dynamics of your group and your objectives all factor in when choosing the perfect and most effective energising activity. In a hurry and want to speak to us right now? Call us on 0800 083 1172! Sometimes the size of a group can make organisers feel that there's nothing that can effectively work for them, perhaps they feel the group is too large or on the flip side, that their group is too small. It's true to say that not all conference icebreakers work well for all sized groups but we are experts at directing you to the right solution for your group. When we talk about large groups, we really mean groups of 150 right up to a whopping 10,000 and yes, we have conference icebreakers and energisers to maximise the power of large numbers in a way that you wouldn't have thought possible! 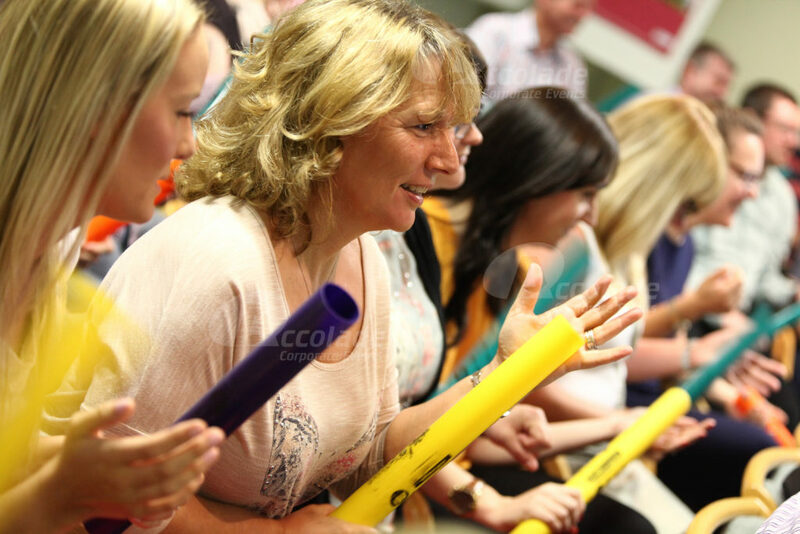 Conference energiser activities for large groups that work really, really well include Boomwhackers, Haka, Get Up and Logo, Team Millionaire, Drumming, Graffiti Workshop, Clap Happy, Your Song and there are many more incredible possibilities! When we talk about small groups we mean anything from 150 people right down to just 7 people, we've got a whole host of energisers that will work incredibly well for these size of groups. Energisers that work well for small groups include activities like our fabulous Thriller, Drumming, Graffiti Workshop, and Movie Making. Whatever the size of group you have we have the perfect conference energiser activities for you; so why not fill in our contact form and we'll call or email you back - whichever you prefer, or just call us on 0800 083 1172 and we'll be happy to talk through the many different effective events for you.